Note: For an in depth history of the name "Dutch Oven" and the cast iron oven called a "Dutch Oven" I suggest the book "Dutch Ovens Chronicled, Their Use in the United States" by John G. Ragsdale, published by the University of Arkansas Press. 1. In 1704 a man by the name of Abraham Darby traveled from England to Holland to inspect a Dutch casting process by which brass vessels where cast in dry sand molds. Upon returning to England Darby experimented with the process and eventually patented a casting process using a better type of molding sand as well as a process of baking the mold to improve casting smoothness. Darby eventually began casting pots and shipping them to the new colonies and throughout the world. 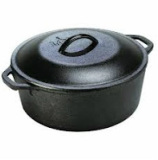 Ragsdale suggests that the name "Dutch Oven" may have derived from the original Dutch process for casting metal pots. 2. Others have suggested that early Dutch traders or salesmen peddling cast iron pots may have given rise to the name "Dutch Oven". 3. Still others believe that the name came from Dutch settlers in the Pennsylvania area who used similar cast iron pots or kettles. Other ovens may also be called a "Dutch Oven" such as cast aluminum Dutch ovens and cast iron pots or kettles with rounded lids, flat bottoms and no legs. Lodge Manufacturing Company which makes the majority of Dutch Ovens being sold today, distinguished the two types of ovens by calling the rounded top, flat bottom oven with no legs, a Dutch Oven. The oven with a flat lid with a lip around the edge and a flat bottom with three legs they call a "Camp Oven". Ragsdale indicates that cast metal pots have been in use since the seventh century. The Dutch Oven of today has evolved over the years as various manufacturers made refinements and improvements over previous version of cast metal pots. The shape of the "ears" has evolved as has the length and thickness of the legs. The lid also has seen many changes ranging from rounded to flat and from no lip to various shapes of lips or flanges. No matter what you call it or what shape it is cast to, a well prepared meal from a Dutch Oven has a delicious flavor unmatched by most other cookware. A round lid with no legs Dutch oven. Commonly used for indoor cooking. A flat lid with three legs Dutch oven. Also known as a "Camp oven".